"Comprehensive, clutter-free project management for any team or business." Hitask scored 88/100 in the Task Management category. This is based on user satisfaction (88/100), press buzz (47/100), recent user trends (rising), and other relevant information on Hitask gathered from around the web. HiTask is a comprehensive online software solution intended to help businesses and various types of teams deal with effective project and task management. More than just your regular to-do list app, this software was developed in 2006 by Anton Sulsky and Roman Roan to promote team collaboration as well as to simplify the process of organizing tasks and projects. The software makes delegating tasks among the team much easier and more systematic. Once the users have set up a list of tasks they need to tackle, they can easily click on any particular task and then drag it on to the person’s name who’s going to be assigned to it. They are also able to modify shared items and add comments on tasks if they need to. Since the software promotes team collaboration, it allows all users to view all tasks that need to be done through the shared option. However, they would need to have permission (from the project admin) to change tasks. Whenever a scheduled event is created, everyone in the team gets notified. The same thing happens when a new task is created or whenever a task is completed. Additionally, users can also conveniently attach any relevant file in the tasks so other team members can have access to it. All the tools the users need to initiate task management are all accessible in the software’s single screen dashboard. In order to view more details or notes involved in a task or to modify them, users can simply access the dashboard. The order of priority among tasks can also be changed in a snap through HiTask’s drag-and-drop functionality. With the use of a single interface, team members will find it easy to switch tabs or groups to manage tasks according to team member, context, project name or date of deadline. An easily viewable and accessible team calendar is also set in place, allowing team members a quick view of the tasks and all other scheduled events. The software also has a feature where users can track or record the time it took them to complete a specific task. Along with that, it also enables them to come up with a comprehensive progress report that breaks down the different tasks involved in a certain project as well as the team members who are working on it. This provides everyone with an overview of the progress happening on the project as well as the progress in terms of each team member’s productivity. HiTask is supported on both Android and iOS as well as in various browsers. In cases of emergency, users also have the option to work in offline mode. In terms of storage, data can be synced to Microsoft Outlook and Google Calendar. Tasks can be created through email and they can also integrate the software with other third-party apps such as Zapier. In terms of security, HiTask is equipped with SSL/HTTPS encryption in its communication functions. It is also built with redundant data mirroring that includes continuous encrypted backups. What are the benefits of using HiTask? The software’s simplified interface makes it easier for users to save time. They won’t have to spend ridiculous amounts of time to train each member on how to use the software. With that, team members can get more done in less time. The software’s intuitive drag and drop UI makes it very convenient. This makes it easier for users to create, modify and assign tasks. All important details can be seen in a single dashboard and users won’t have to switch tabs that often. File sharing is also a convenient feature to have as it helps save time. Teams with five members or less can use the software for free. This package includes limited reporting, 0.5 GB storage allowance for the entire team, access to shared tasks lists and calendars, as well as the option to create unlimited tasks and projects. However, they do offer a Team Business plan for users who want to take advantage of more features. This paid version, which comes at $4.98 per month, includes all of HiTask’s features as well as a larger storage allowance and more in depth reporting. Access permissions among members can also be customized in the paid version. This software is practically built for every project manager on the go. Its features will prove useful especially to those who handle more than a handful of team members. 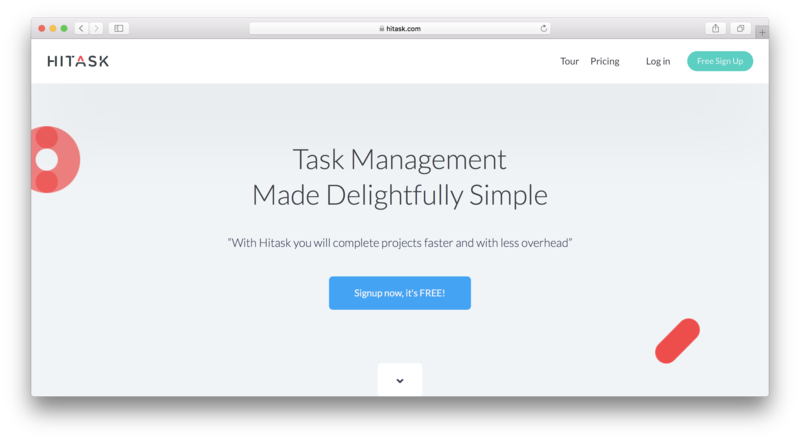 Delegating tasks, monitoring progress, keeping track of deadlines is easier with the help of HiTask. Although the free version would suffice for smaller projects with less team members, the Team Business package seems like a good investment for more complicated and larger projects. What platforms does Hitask support? Who are the main user groups of Hitask? What is Hitask generally used for? Does Hitask integrate with any other apps? Does Hitask offer guides, tutorials and or customer support? Does Hitask offer an API? Does Hitask offer multi-user capability (e.g. teams)? 4.42/5 based on 86 user ratings. What do you like about Hitask? I like it because I can organize events and tasks in a simple way, thanks to the software I can manage my work time and the corresponding management of different businesses to complete, with the ease of subtasks to decompose the work to be done. With the synchronization of the Google calendar it is easier to carry each of the events and their corresponding dates to the day. What do you dislike about Hitask? The software works perfectly, however, personally I need more tools to configure and customize my work, this is the only drawback that I present. What have you been using it for and what problems did Hitask solve? Now I stay with more follow up in each and every one of my activities, managing my projects, developing a better communication and synchronization of work with all my colleagues. Hitask is a really incredible software that allows me to manage my tasks and projects in a very dynamic and professional way. It provides a quick and effective organization system, where I can manage everything with maps, task lists and organizers, according to my preferences which is fantastic because I have everything very visual for When I need it, at any time and at any time adapt perfectly to my work needs. It presents a unique, intuitive and very versatile interface that makes it facial to install, configure and use. Hitask is an incredible software to organize and manage tasks that allows me to do my daily work in a simple and very dynamic way since it provides a quick and effective organization system through maps, task lists and organizers where I can see everything in a way very visual and I can customize it according to my preferences and needs, which is incredible because I have everything in sight for When I need it, in every moment and at any time. It presents a dynamic and very complete interface with incredible tools that makes it easy to use and configure. It is also important to note that I can enter from any device which allows me to keep track of everything. until now I do not find any negative characteristic that is relevant, since the software is quite complete and if I present any inconvenient the customer service solves it almost immediately. Since I began to implement Hitask in my work routine, our business performance has increased considerably as it allows us to be better organized and offer a better service to our customers. - The very complete software has a quick system for organizing and managing information. - It gives me the opportunity to store information and also modify it according to the preferences of my organization, through lists, tasks or calendars, it is great to have so many tools at hand and in this way manage everything according to my needs and requirements. - It is simple to use and configure. - Ease of attaching files and simplicity to share with all my colleagues at work. - Quick and easy access from any electronic device. The only thing that displeases me a bit is that the process of using software as such is a bit slow, it slows down as I attach files, makes the work a bit heavy and does not contribute to progress in all the projects I want to work. Hitask is a tool with millions of capabilities, it has made us develop ours. Now we have a better organizational training at all levels, we keep the flow of information constant thanks to the fact that we can share information, all this allows us to advance in our projects and business and, therefore, we have improved the quality of work and time invested in that. As a Hitask user and concurrent worker, I have been able to see the ease of its use and the great advantages it brings to my life. Hitask is an exceptional organization option.